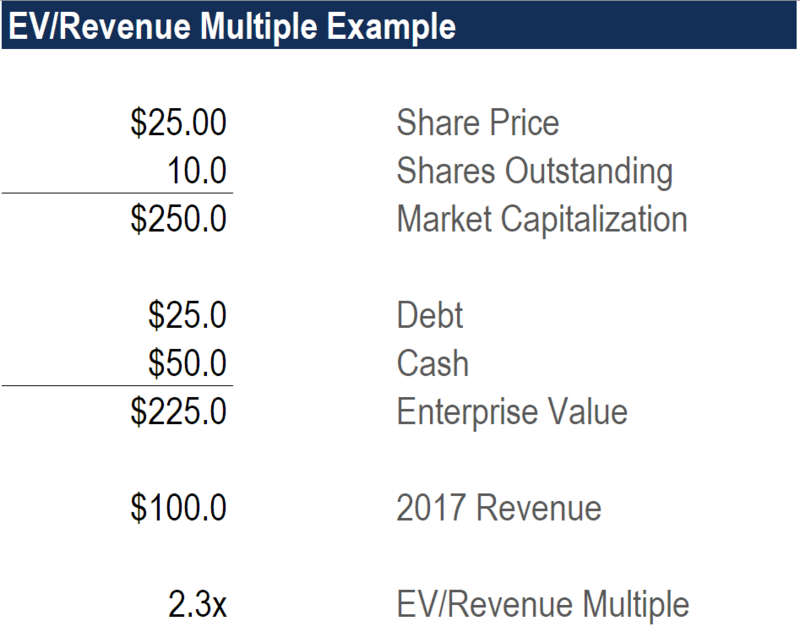 What is the Enterprise Value (EV) to Revenue Multiple? The Enterprise Value (EV) to Revenue multiple is a valuation metric used to value a business by dividing its enterprise valueEnterprise ValueEnterprise Value, or Firm Value, is the entire value of a firm equal to its equity value, plus net debt, plus any minority interest, used in valuation. It looks at the entire market value rather than just the equity value, so all ownership interests and asset claims from both debt and equity are included. (equity plus debt minus cash) by its annual revenueSales RevenueSales revenue is the starting point of the income statement. Sales or revenue is the money earned from the company providing its goods or services, income. The EV to Revenue multiple is commonly used for early-stage or high-growth businesses that don’t have positive earnings yet. Why use the EV to Revenue Multiple? If a company doesn’t have positive Earnings Before Interest Taxes Depreciation & Amortization (EBITDA)EBITDAEBITDA or Earnings Before Interest, Tax, Depreciation, Amortization is a company's profits before any of these net deductions are made. EBITDA focuses on the operating decisions of a business because it looks at the business’ profitability from core operations before the impact of capital structure. Formula, examples or positive Net IncomeNet IncomeNet Income is a key line item, not only in the income statement, but in all three core financial statements. While it is arrived at through the income statement, the net profit is also used in both the balance sheet and the cash flow statement., it’s not possible to use EV/EBITDAEV/EBITDAEV/EBITDA is used in valuation to compare the value of similar businesses by evaluating their Enterprise Value (EV) to EBITDA multiple relative to an average. 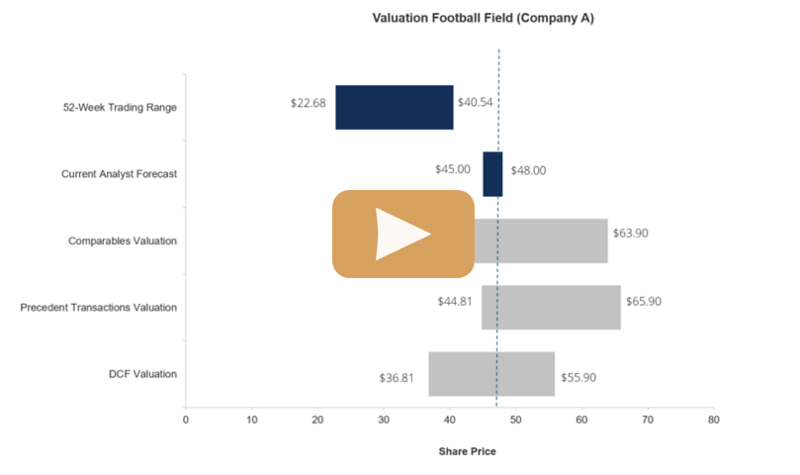 In this guide, we will break down the EV/EBTIDA multiple into its various components, and walk you through how to calculate it step by step or P/EPrice Earnings RatioThe Price Earnings Ratio (P/E Ratio) is the relationship between a company’s stock price and earnings per share. It gives investors a better sense of the value of a company. The P/E shows the expectations of the market and is the price you must pay per unit of current (or future) earnings ratios to value the business. In this case, a financial analyst will have to move further up the income statement to either Gross Profit or all the way up to Revenue. If EBITDA is negative, then having a negative EV/EBITDA multiple is useful. Similarly, a company with a barely positive EBITDA (almost zero) will result in a massive multiple, which isn’t very useful either. For these reasons, early stage companies (often operating at a loss) and high growth companies (often operating at breakeven) require an EV/Revenue multiple for valuation. Here is an example of how to calculate the EV to Revenue multiple. Suppose a company has a current share price of $25.00, shares outstanding of 10 million, debt of $25 million, cash of $50 million, no preferred shares, no minority interest, and 2017 revenue of $100 million. What is its EV/Revenue ratio? $25 times 10 million shares is a market capitalization of $250 million. Add $25 million of debt and deduct $50 million of cash to get an Enterprise Value (EV) of $225 million. $225 million divided by $100 million of revenue is 2.25x EV/Revenue. Why is EV used in the numerator instead of Price (or Market Cap)? EV is used instead of the Price or Market CapMarket CapitalizationMarket Capitalization (Market Cap) is the most recent market value of a company’s outstanding shares. Market Cap is equal to the current share price multiplied by the number of shares outstanding. The investing community often uses the market capitalization value to rank companies in the numerator because of the revenue before interest expense on the income statementIncome StatementThe Income Statement (or Statement of Profit and Loss) shows performance from operations of a business. The financial statement begins with revenues and and therefore represents income that’s available to all investors (debt and equity). Once interest expense is deducted, then the Price or Market Cap would be used in the numerator, as with the Price to Earnings ratio. What are the Pros and Cons of the EV to Revenue Multiple? As a case study, you can learn how to calculate the EV to Revenue multiple in two of CFI’s online courses. The first example is in the Business Valuation course, which leads students through a detailed exercise of creating a “Comps Table” or comparable company analysis. The second example is in CFI’s e-Commerce Financial Modeling course, where students will build a model from scratch to value a business, which includes determining the company’s EV/Revenue ratios across various years. Thank you for reading this guide to EV/Revenue ratios. CFI is the official provider of the Financial Modeling & Valuation Analyst certification, which teaches on-the-job applications of finance to help anyone become a world-class financial analyst. Financial Modeling & Valuation Analyst ProgramFMVA™ CertificationThe Financial Modeling & Valueation Analyst (FMVA)™ accreditation is a global standard for financial analysts that covers finance, accounting, financial modeling, valuation, budgeting, forecasting, presentations, and strategy.